ISO 3302-1:2014 is the international standard for specifying dimensional tolerances for Vulcanised Rubber Moulded, Extruded, and Calendared products, including Rubber Castors and Wheels. 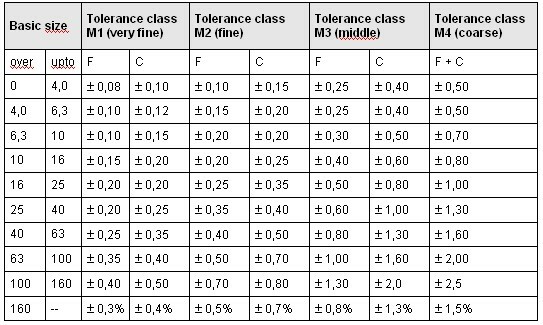 The standard allows manufacturers to define the tolerances of their products, classifying them within four different tolerance classes – M1, M2, M3 & M4. For rubber moulded products, such as Rubber Castors and Wheels, the tolerance of the product will increase, depending on size. The larger the dimension, the wider the tolerance. – This is due to shrinkage of the rubber during the final stages of manufacture. For Rubber Castors and Wheels, products generally fall into M3 & M4 classes, with the tolerances relating only to the rubber components (i.e. the rubber thread). The tolerances do not relate to the metal components or the fabricated/assembled parts. “C” (Closed Dimensions) – These are tolerances related to dimensions which are affected due to the mould design, particularly in compression moulding. When a cavity is filled with rubber, the exact volume of rubber, and also the pressure applied to the mould during moulding, can affect certain dimensions of the finished Rubber Castors and Wheels. If the cavity is slightly overfilled, or slightly less pressure is applied to the mould, there will be a tendency for the mould to try to remain fractionally open. This may be due to rubber flash within the mould split line, not allowing a 100% closure. Whilst this is a normal process, it does slightly reduce the tightness of the tolerance. “F” (Fixed Dimensions) – These are tolerances related to dimensions of the Rubber Castors and Wheels which are not affected by the mould design. I.e. whilst any flashing may affect the thickness of a Rubber Castor Wheel, the diameter will not be affected by any excess flashing, and therefore can be controlled to a tighter tolerance. Bulldog Castors Ltd specialise in Rubber Castors and Wheels. Providing expert advice, engineered solutions and in house rubber analysis equipment.